On average, only 22% of credit union members are “truly loyal” to their credit union. “Truly Loyal” means they choose your credit union as their primary financial institution, recommend the credit union to others, and contact the credit union the next time they need a financial product or service. These members are proven to use more products and services than those who only meet one or two of the “truly loyal” criteria. 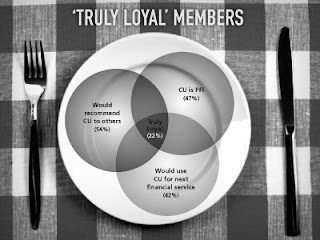 And true loyalists are three times more likely to have actually recommended your credit union than members who don’t meet all three criteria. SO, HOW DO YOU CULTIVATE TRULY LOYAL MEMBERS? In this business, the price of admission includes a couple of key factors: competitive loan rates, minimal service charges or fees, broad range of services and high quality of service. While you may not be able to make significant changes to the first three, the last factor is within your immediate control. Service quality depends on the performance of your staff. The performance of your staff is directly impacted by the mindset and environment as a whole: your internal culture. Loyalty metrics often lack the necessary insights that help executives make decisions. Instead, executives would be well placed to incorporate wallet-share, life time value, ROI and other metrics that are actionable and very specific about the status of the current situation and what levers can be pulled to improve performance. HBR recently published a terrific article on wallet-share (http://hbr.org/2011/10/customer-loyalty-isnt-enough-grow-your-share-of-wallet/) --- a must read for all marketing and senior executives involved in member acquisition and/or business performance management.